So many of the gigs available to bands, duos and solo artists are in smaller venues such as pubs or wine bars nowadays, and many such spaces have no house PA. So it’s now up to musicians to bring their own sound reinforcement systems, and therefore to choose one that fits their budget, their sound requirements, and their transport. The days of carting around huge (and largely unnecessary) bass bins in the back of a beaten-up van are behind us, thanks to developments in driver technology and Class-D amplification, which have allowed PA systems to be made much more portable yet still adequately powerful. And with quick setup and tear-down times usually being mandatory, musicians are increasingly turning to powered speakers, which don’t require external amplifiers and crossovers, and all the extra cabling that those entail. But before deciding on a system, you have to ask yourself what you intend to put through the PA, how loud you need to it be, how much bass end you need it to handle and, of course, the physical size (and weight) that your transport (and back!) can accommodate. What is important in an active speaker is not so much the amplifier power, but rather the maximum clean SPL (sound pressure level) you can expect from the speaker. If you are playing in a band with drums, then a pair of modestly sized (typically 10- or 12-inch) tops capable of 125dB or more at one metre might be enough, provided you’re handling mainly vocals and non-bass instruments, but if you plan to put much in the way of bass and drums through the PA — which is unnecessary in most pubs — then you’ll probably need to look at adding a subwoofer. The advantage of this ‘modest tops plus sub’ approach is that in most cases a single sub will suffice. Some can be quite small (a single 12-inch or two eight-inch drivers), and if you need to extend the system’s low-end capability for larger gigs, then you can always add a second sub or choose a larger one. Using an active sub also takes some of the load off your main speakers, as they almost always have an in-built crossover that feeds a high-pass filtered version of the input to the mains, so your sound may be noticeably cleaner than when using the main speakers on their own. If taking the mains-plus-sub route, unless the sub comes as part of a system, check that the maximum SPL of the sub is approximately the same as (or slightly greater than) that of the main speakers you plan to use it with. A tip here is that if you use multiple subs, stack them together rather than at opposite sides of the stage, as the close proximity improves the coupling and makes them more efficient at low frequencies. Also avoid putting your subs on raised stages as the ground reflections can cause phase cancellation problems that result in an uneven bass. Where possible put them at floor level. It doesn’t matter if they are all to one side of the stage, as low frequencies are largely non-directional. Where more low-end power is indeed necessary, one alternative to a tops-plus-sub system is to go for a pair of 15-inch full-range speakers. You still have the option of adding one or more subs for larger venues, but they should be fine on their own for smaller venues where only a modest amount of drums and bass needs to go through the PA.
For larger venues with a capacity of, say, 200 to 400 people, a system that can reach an SPL of 130dB or more is desirable. This kind of system usually involves two or more subs, which tend to be an integral part of larger PAs. Hopefully most large venues will have their own sound system, but if you actually need a system of this size yourself then you’re either back to the van scenario or sharing the PA carrying duties between several large hatchback cars. But we’re straying out of small PA territory here, so I’ll leave it at that. For modest band gigs, a ‘subs plus tops’ approach offers a good balance between volume and portability. For solo artists and duos without drums (or maybe who use a cajon for percussion), a system rated at 115dB or above at one metre should be ample, and a sub will probably be unnecessary unless deep bass (such as DI’d bass guitar or bass synth) is involved. Even ‘PA in a suitcase’ solutions can work well for a guitars-plus-voices kind of act. 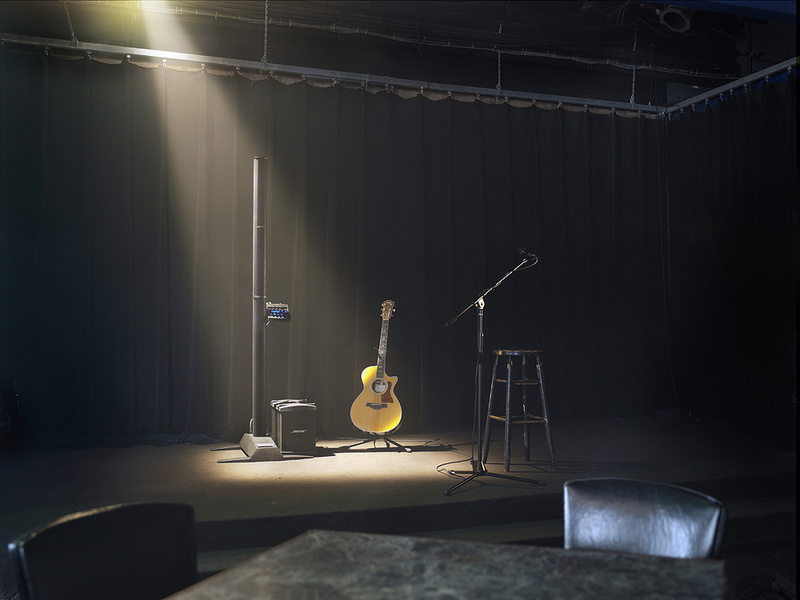 Fender’s Passport system got that whole ball rolling, but Yamaha also make a range of Stagepas systems up to 600 Watts or so. These systems usually include a basic mixer, making them very convenient and further cutting setup time and the amount of gear you have to carry. In the case of an acoustic guitar-based act, if the guitar is fed into an acoustic combo (most of which also have a mic input), simply adding a small powered extension speaker to the combo, fed from its link output, may be all that’s needed to give a wide coverage. Since such combo amps are usually placed behind the performers, this solution also provides an alternative to conventional foldback (as long as the level is kept low enough to avoid feedback), and so is ideal when working in cramped spaces. If more than one mic is needed, a small mixer can always be fed into the combo. And in larger venues, two powered speakers can be used, either fed from the combo again or directly from a mixer if more inputs are needed. In my own pub trio, where the percussion comes from a cajon rather than a drum kit, we use a pair or 150-Watt Schertler powered speakers with eight-inch drivers. One of the speakers has an integrated mixer, though we tend to feed both from a separate mixer as we need more inputs and like to run the PA in true stereo. This produces plenty of clean level, even when fed some cajon, and the built-in mixer means we have a fallback — if our main mixer or one of the speakers fails, we can usually get by using what is left over. 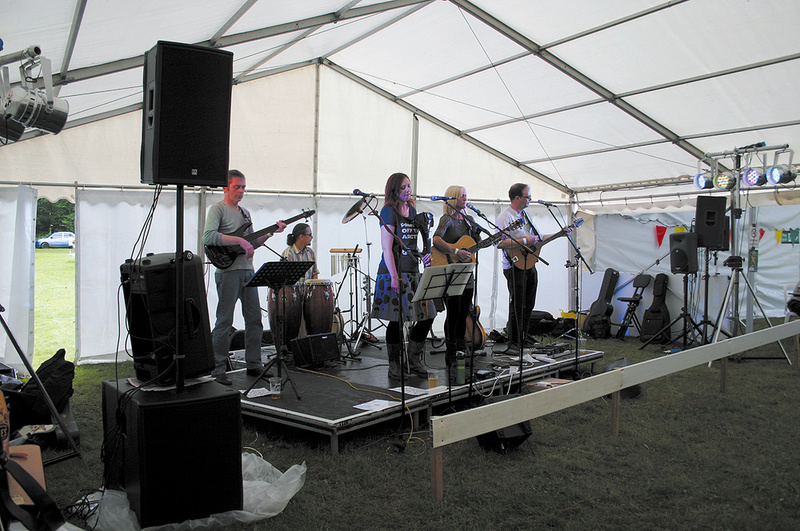 However, in very small venues we sometimes switch to using just one of the Schertler amps plus an acoustic guitar combo, and forgo the luxury of stereo. It is always a good idea to have enough gear that you can cobble together at least a vocal PA if something should fail. Sometimes there can still be an advantage in using a small system that includes a compact sub, as it allows the main speakers to be made even more compact. For example, I have a pair of Mackie SRM350s (10-inch active speakers) that I use with a Mackie DLM12 sub for some pub-sized venues where drums are part of the line-up, and the sub is small enough and light enough to still fit into my car. This configuration is quite flexible as I don’t need to take the sub when it isn’t needed. Then there are several dedicated sub-plus-satellite options, such as the LD Systems Dave range, where again the main speakers are quite small and the sub really handles just the lower mids and normal bass register, rather than ‘true’ sub bass. These dedicated 2.1 systems can’t usually be split to be used without the sub, but they are very compact, and the smaller top speakers are less likely to obscure the band from the audience. 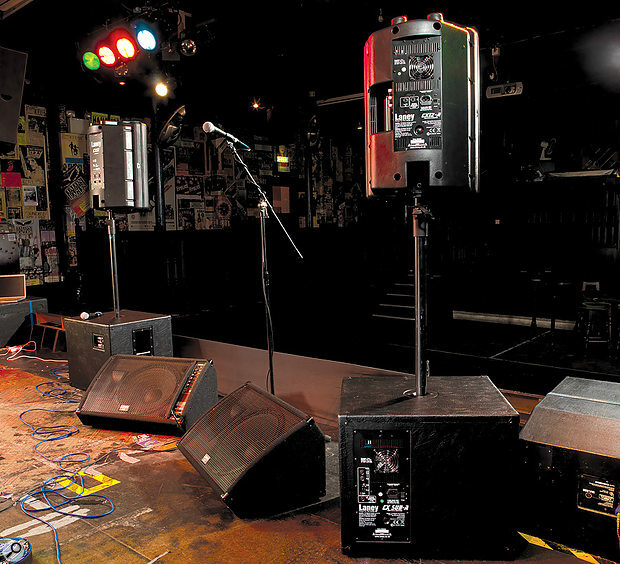 The larger versions of these satellite-plus-sub systems can work well for bands with drums in pub-sized venues, while the smaller ones are again ideal for guitar and voice type ensembles. 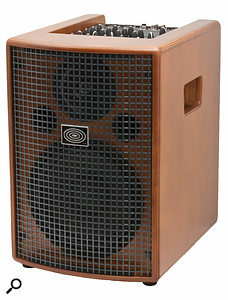 Recently we’ve seen a lot of compact line-array speakers appearing on the market. These will typically comprise a long, thin column housing multiple small speakers, teamed with one or two compact subs. 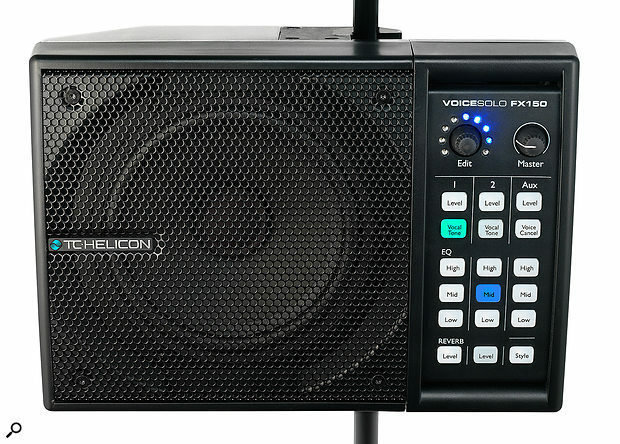 Popular examples include the HK Elements and Turbosound iP1000 and iP2000 systems. There’s also the Bose L1 approach, which is slightly different as the drivers are angled to produce an even wider dispersion. 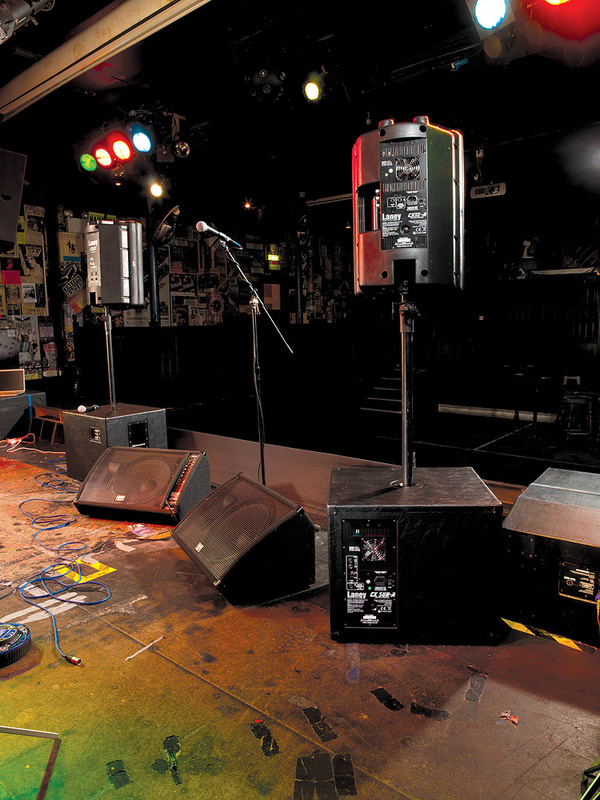 The JBL Eon One, reviewed in this issue, is a good example, and LD Systems also produce affordable mini line-array systems, while companies such as Fohhn offer extremely elegant systems higher up the price ladder. Mini line-array-type systems, such as the Bose L1, have proven extremely popular thanks to their even sound coverage and high portability. Line arrays have the advantage of maximising the horizontal coverage while directing less sound onto the floor and ceiling, as the wavefront they project is closer to cylindrical rather than the spherical shape produced by a single driver. Their wide dispersion means they are less likely to deafen people near the front while still delivering plenty of sound to the rear. Their multiple small drivers, meanwhile, are kind to the crucial mid-range — so important for vocals — while their narrow profile again bodes well for clear sight lines. A small act can get perfectly good results using just one of these systems, while a band with drums may choose to use a pair. I like both the sound and the portability of these mini line arrays as they tend to sound more ‘hi-fi’ than most conventional compact PA speakers, but there are potential pitfalls. Firstly, they can’t be used without the sub, and secondly, most models put all the active electronics in the sub, so if the sub fails in a single-sub system, your whole system is dead. Monitors that can double as an emergency vocal PA may get you out of trouble, but you should always have a backup plan. If you’re a self-mixing act, then feeding the front-of-house mix back to a stage monitor might be all you need, as it’ll let you hear yourself as well as hearing the same balance that the audience are hearing. I also do the ‘walk out front with a long guitar cable’ thing just to check everything sounds balanced, as we don’t put the electric guitar through the PA so its level needs to be adjusted from an audience perspective. We use a small analogue mixer for simplicity, though some of the smaller Wi-Fi tablet-controlled mixers are also appealing, as they include all the processing you need including effects, dynamics and comprehensive EQ, and you can make adjustments from a tablet mounted on your mic stand. You can also take the tablet out into the audience space during the soundcheck and make adjustments from there. Where you do have a separate mixing engineer, tablet-controlled mixers are even more appealing as they save a lot of setup time and avoid the need to run multicores around the room, with all their health and safety implications. I use a wireless mixer whenever I’m doing the sound for somebody else, and it makes life so much easier. 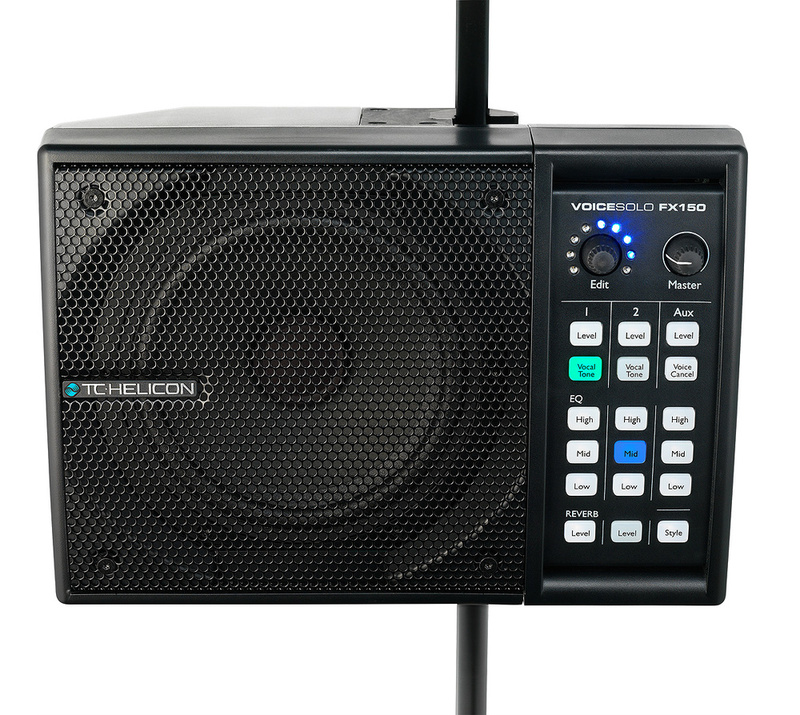 Stand-mounted monitors, such as this example from TC-Helicon, have the advantage that they can be adjusted by the singer directly. There are several monitoring options these days, from floor wedges and stand-mounted mini monitors to in-ears or simple side-fills. For pub-type gigs I favour stand-mounted mini monitors, as they can go adequately loud and take up little space. The reason they can go so loud is that all the bass end is rolled off, but you don’t notice that as the low end from the main PA fills it in for you. I use a Mackie SRM150 for this, which has in-built gain and EQ; you can even plug a mic directly into it if you need a mini PA. TC-Helicon also make a nice alternative complete with built-in reverb. My SRM150 has got me out of trouble on more than one occasion when something else has failed, taking over the duties of one side of a PA. Again the bass from the other side fills in so that the limited bass response isn’t really noticeable, and in a small venue you can generally get enough clean level out of it. For larger events such as outdoor festivals, my Mackie SRM350s sometimes get redeployed as wedge monitors, with my wireless mixer, which supports up to six separate monitor feeds, handling the main and foldback mixes. If you tend to play in venues that range from the tiny to the quite large, as we do, then it often pays to choose system components that can be deployed in different configurations, rather than being forced to take the same system to every venue. Where you just need a bit of reverb, then a mixer with integral effects and an effects bypass footswitch is the simplest option for self operation. If you are using a tablet-controlled mixer, then you can bypass the effects from there when chatting between songs, and even call up different effects presets. If you’re after something more sophisticated but still not overcomplicated, then companies such as TC Electronic, Digitech and Roland offer various vocal processor options, some in a very simple stompbox format — such as TC’s Mic Mechanic, which includes delay, reverb, tone shaping and gentle pitch correction. Recently we’ve been using the TC-Helicon Perform-V, which clips to a mic stand and can handle reverb, delay, doubling, pitch correction and harmony effects, arranged as simple push-to-activate presets. Further editing to the effects can also be done using a computer. So far this has proven very convenient as it allows the vocalist to bypass and select effects without changing position. It seems to offer a good compromise between instant gratification and being a ‘do everything’ vocal processor. Some manufacturers, including Mackie and Studiomaster (whose Starlight system is pictured here) have started integrating monitors into the side of their PA speakers, which negates the need for separate monitors for small gigs.Another small-venue PA option includes speakers such as the Mackie Reach, which has two offset tweeters and two main drivers, plus two smaller side-mounted speakers that can either be used to further widen the stereo spread or to act as monitors. This is a very practical option for acts that don’t need to be hugely loud, as the side-mounted monitors provide plenty of clean foldback. 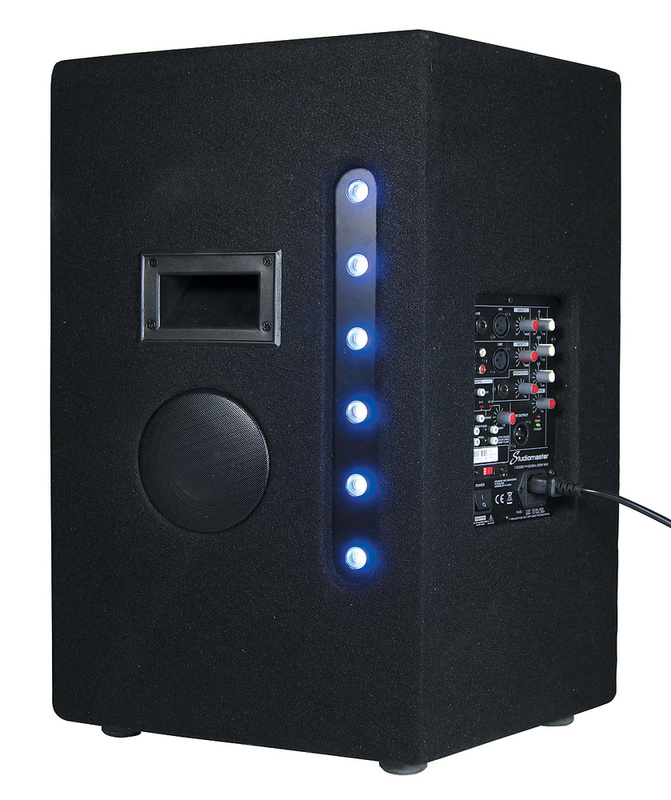 Other speakers featuring integral monitoring include models in the Studiomaster Starlight range, which can be used with or without a sub and have adjustable side-mounted monitors (that can be fed from the speaker input or an external input), with optional models also including LED lighting. We tried these out at a gig when they first came out and found they worked really well, especially considering their modest cost. We didn’t need any additional monitoring and we could all hear everything clearly. I hope this is a trend that continues to catch, on as it saves further on setup time, cabling and general clutter. The Bose L1 system also has similar foldback benefits, in that its very wide dispersion means that it can be positioned where both the audience and the musicians can hear it, and it is also very resistant to feedback, which means you can turn it up surprisingly loud even when playing very close to it. Many acoustic instrument amplifiers include surprisingly comprehensive mixer sections, which can get you out of trouble in the event of equipment malfunction.A big part of stress-free gigging includes the knowledge that you have enough redundancy in your gear to cope if something breaks down — because one day it will. Recently at a local festival, I lost four monitors to a voltage spike after a generator trip, so a good surge suppressor will be next on my shopping list! Fortunately we had enough spare powered speakers to cover it, but in a smaller setup just having one or two powered monitors that can be pressed into service as a vocal PA may be enough to get you out of trouble. Many powered speakers can now take a dynamic mic to give you some basic vocals without the need for a mixer, so that may help if the mixer breaks down — just plug the main vocal mic into one of the speakers and its link output into the other one. A broken-down guitar amp is a major hassle, but something as simple as a second-hand Line 6 Pod or similar, programmed with your basic sounds, will let you plug directly into the PA in case your amp fries. If you’re feeling kind you could program a couple of bass patches too just in case your bass player comes unstuck. And if you have a fancy pedalboard, keep a separate overdrive pedal with a good battery in it, as that will get you out of trouble if the board develops a problem that you can’t locate quickly. A spare mic and mic clip is always a good idea too, as I’ve had two or three apparently rugged dynamic mics just die on me over the years, and of course cables fail at the most inappropriate times! Always carry spare jack, XLR and mains cables and make sure that you mark any faulty cables so you can pick them out for repair when you get home. If you need to test XLR cables for crackles, do so with the phantom power switched on as anything intermittent will really make a noise as you waggle it. Add a few basic tools, spare fuses, spare batteries, spare strings, a torch, and especially gaffer tape, and you should be able to overcome most problems.